Russia's new generation of fighters. In the next few years, Russia plans to introduce 2 new jets to their air force, the Sukhoi T-50 and the MiG-35. Here we’ll take a look at the background of the jets and some of their specifications in comparison to their ‘Western’ equivalents. Currently, the only 5th generation fighter in service is the F-22 but Russia are eager to get their answer for the ‘raptor’ into service. The Sukhoi T-50 will be the first aircraft in the Russian Air Force to use stealth technology, several analysts have suggested that this aircraft is designed to be a direct competitor to the US’ F-35 and F-22. Russia expect to sell approximately 1000 of these jets to allies around the world. The project was a joint enterprise by Russia and India, India are thought to have contributed around 35% to the project. The aircraft is expected to be the replacement for the MiG-29 and the Su-27, it is expected to enter service in 2016. 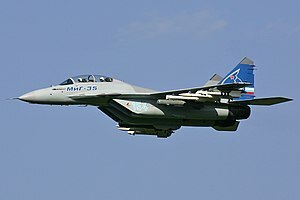 The MiG-35 is a further development of MiG-29M/M2 technology. The aircraft is designed to be exported to Russia’s allies around the world (primarily India) and comes in either a single seat or double seat version. The MiG-35 will be the first Russian aircraft to be fitted with active electronically scanned array radar. The aircraft is intended to be a competitor to the Eurofighter Typhoon and the Dassault Rafale. One of the main advantages that customers who buy this aircraft have is that they will have options to choose from components and systems made by Russian, US, French and Israeli sources. There is no definite date on when the aircraft will enter service. On paper, both the Sukhoi T-50 and the MiG-35 are very similar to their direct competitors, however there is one area where the Russian jets have the advantage, the unit cost. A single F-35 is expected to cost $80 million, a single F-22 costs $150 million whereas the T-50 is expected to cost as little as $50 million. It is the same story for the MiG-35. The Eurofighter Typhoon and the Rafale both cost in excess of $100 million, whereas the MiG-35 is expected to cost between $30-40 million. On paper there is nothing to suggest why there is such a massive price gap, however stats on paper are rarely representative of a working product. Russia expects to be able to make most of their money selling these aircraft to other countries such as Egypt, however Israeli intelligence has said they do not believe the deal will go through, partly due to Egypt's large fleet of US built aircraft. However time will tell if the lower price means lower quality but hopefully we will never have to find out how these direct competitors will fare against each other in a real combat setting.